The nasal rinsing device Capster was developed to meet a vital need — when struggling with rhinosinusitis, Raivo Tamsalu had an idea to try rinsing his nose. Since there were no suitable products available at the pharmacy, he had to make one himself. The prototype of Capster was, in fact, a strawberry jam bottle cap because it had a suitable nozzle that fit into the nose perfectly. “If we glue a regular bottle cap into the jam bottle cap, we will get quite a good nasal rinsing device that is compatible with any plastic bottle. The concept was very simple and it seemed easy to manufacture,” Raivo Tamsalu, one of the creators of Capster, explains. 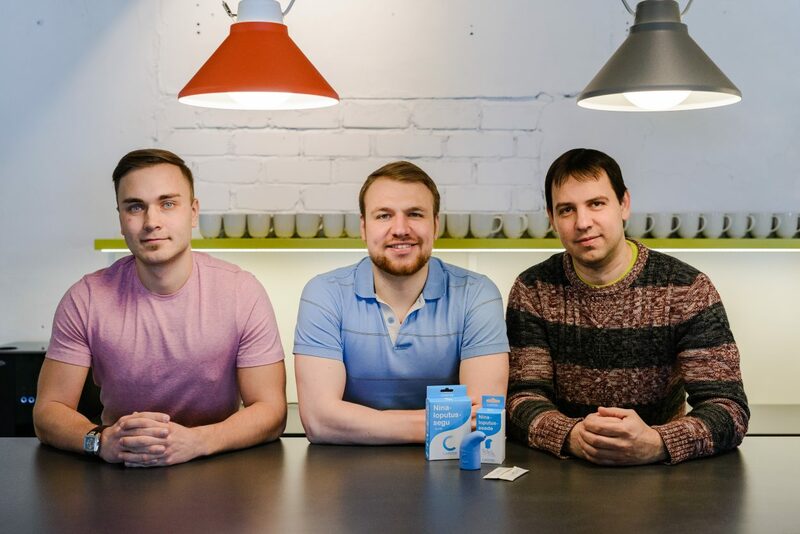 That is how Raivo Tamsalu, Birk Põldme, and Marc Teiv decided to create a real product from a jam bottle cap that could help millions of people. “Over 700 million people around the world suffer from chronic rhinosinusitis. Our product offers a simple and convenient method of treatment, that is health sustainable and evidence-based,” Tamsalu says. Having researched more specifically, they found that different devices for nasal rinsing do exist. “None of them seemed very easy to use and some of them weren’t effective due to lack of sufficient pressure. After nasal surgery, it is advised to rinse the nose with a syringe or to use sprays with ocean water or saline, which are convenient, but that method does not run the fluid through the nose. Some devices are electronic, big, too complicated, and uncomfortable to use. We saw an opportunity to bring to the market something very simple that would create value and would be effective in a medical sense,” Tamsalu describes. “Capster is designed so that it could be held comfortably straight. There are valves inside the device that prevent contaminated fluid from flowing back into the bottle and a separate air channel, which does not allow a vacuum to develop in the bottle. Capster is small enough to fit into a pocket but at the same time, allows nasal rinsing with a solution of 500 ml in a very comfortable position. The device is compatible with any conventional standard-sized plastic bottle,” Tamsalu says. “The Capster product portfolio also includes a pharmaceutical grade nasal rinsing mix sachet, which can be poured into half a litre of water to prepare a physiological or 0.9% saline rinsing solution. The ideal temperature of the liquid should be close to body temperature. Rinsing the nose with cold and ordinary tap water is unpleasant and irritating,” Teiv explains. The seemingly simple idea was followed by a two-and-a-half-year-long development process, during which, among other things, there was cooperation with several product development partners and communication with dozens of manufacturers around Europe. Various 3D printing technologies were tested, different prototypes were made by hand and produced industrially again and again, and designers from Argentina and India were asked for help. “We involved ear-nose-throat doctors in the product development as well. For example, we calculated what could be the medium size of the nose so that the tip of the device could fit both children and adults and that there would be the best possible rinsing angle for a comfortable rinsing position,” Põldme adds. The whole process was agreed to be undergone only because a very large market potential was seen in the product. “On a global scale, about 700 million people suffer from chronic rhinosinusitis. Nasal rinsing has a great role in improving their quality of life but there is a lack of good solutions for this treatment method. Nasal rinsing as an effective and health sustainable treatment method is strongly recommended by the medical specialists as well. This is indicated by numerous high-quality research studies in high ranking scientific journals. Due to the extensive amount of conducted studies, nasal rinsing is at the heart of the treatment guidelines for chronic rhinosinusitis as well,” Tamsalu emphasises. Nasal rinsing is suitable for children and it also helps expectant and nursing mothers, who cannot use many medicines. Nasal rinsing is irreplaceable for recovering after surgery, while the nose restores its natural function. Capster started in the spring of 2014. In the same summer, its founders joined the Tehnopol-incubator, where they received advice on who should be included in their team and what steps had to be taken next. In the summer of 2015, an investment was raised in order to start manufacturing the developed device but surprisingly it turned out that it was not possible and the product had to be re-developed. “It was an interesting but difficult period. By the summer of 2016, we achieved the product, which we dared to sell to the consumer and we sent Capster out to 200 consumers, who had been waiting our product,” Põldme says. As of March 2017, Capster has sold over 6000 products. “We learned a lot about mass production and due to our naïveté and lack of experience we learned hard lessons about cooperation with subcontractors, both product developers and manufacturers,“ Põldme says. At the same time, they have understood why start-ups create few physical products – starting production is so capital-intensive and prototyping cycles take lots of time. In five years’ time, the founders of Capster hope to be on the American market, which is seen as a logical development. “The American market is big and nasal rinsing is more known. Today, we see the competitive advantages of our product compared to their local products. In addition, we intend to expand our product portfolio and we see great potential for global online sales network,” Tamsalu says. Capster’s founders say that their objective is to popularise a health sustainable treatment method that helps many people and has been recommended by medical science and treatment guidelines. “We have no objection when people prepare a rinsing device from a jam bottle by themselves or use alternative products. The aim is to spread the word about a high-potential treatment method and that from the medical point of view, it would be done correctly. As it happens, we just have developed the best nasal rinsing device in the world.” Such confident statements are illustrated with user feedback: “People who use Capster praise it. Physicians have also said that they have felt the need for an efficient rinsing device in the Estonian market and now recommend Capster to their patients,” Tamsalu confirms.